This summer, I decided to make it a summer about the fans, at Nucksaid. So far, I have had the privilege of sharing sixteen True Blue stories from others, and of course my own with all of you. There are still more stories on the way from BC, Australia & the UK!, but like me, you will have to wait until they send in their final responses! We will await their stories eagerly and as I have said all summer long, there is STILL room for even more of your stories to be told! 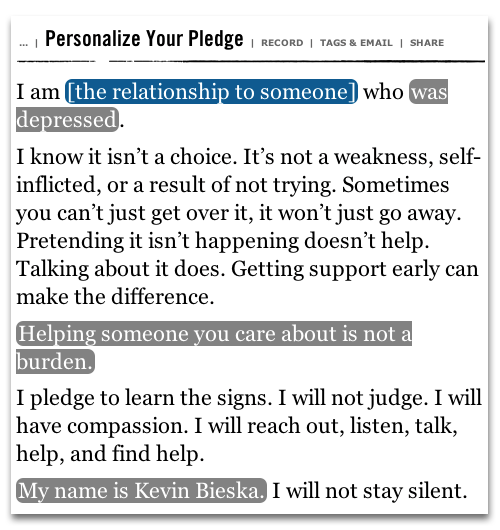 If you would like to also share your True Blue story, simply send me an e-mail to nucksaid@gmail.com with the subject line: TRUE BLUE and I will send you all the details needed. 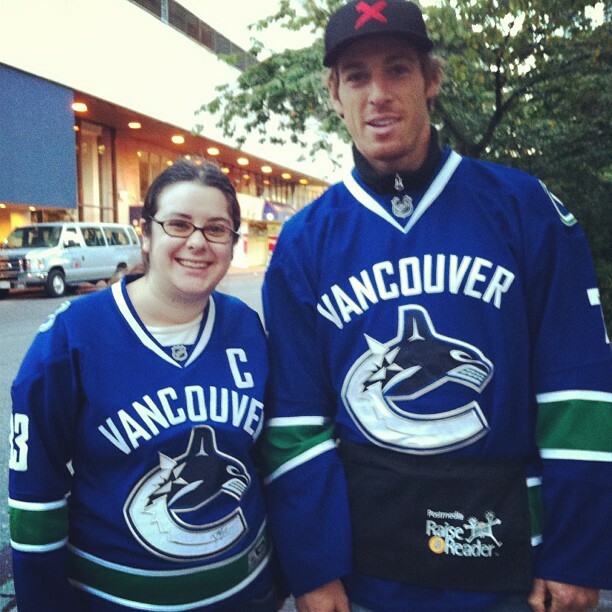 I’d like to feature as many Canucks fans as possible before the season starts on October 8, 2014. There’s even room for some rival fans to be featured about the hockey team they love, if they’d like to share their love of the game and for their teams! The summer of True Blue continues at Nucksaid! Sometimes it can feel like an off-season drags on for ages, so I decided to help pass the time until the puck finally drops on October 8, 2014, that I would feature the FANS and their stories! For those would like to participate in the series, all you have to do is send me an e-mail to nucksaid@gmail.com with the subject line: TRUE BLUE and I will send you all the details you need! The True Blue profiles will continue until the eve of the first regular season game, so there is LOTS of time to feature even more you :)! Today’s True Blue edition brings to you a special sister-sister profile featuring two of my three sisters. Without further ado, please meet Abigail & Jessica Laug who while they may be 16 months apart, are more alike than even they know. “My love of the Vancouver Canucks began in 2006 when the great Roberto Luongo joined the team as our lead goalie. I love watching the games on TV or live at Rogers Arena. I faithfully cheer for my team EVERY hockey season no matter what the outcome. When the season’s over, I go through a period of impatience for when hockey will return. There is no greater feeling than going to a live hockey game, and watching your home completely crush the opposing team! Plus it’s always fun seeing other fans get just as excited as I do! My favourite Canucks player is Captain Henrik Sedin, aka Hank. I love the way he leads the team on and off the ice. 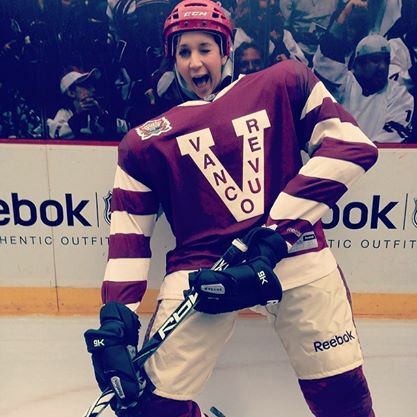 His skills on the ice are amazing, it’s incredible that him and his brother Daniel can pass the puck without lookingg. Hank and Danny have set up many goals for our team over the years. My all-time favourite Canucks moment is when Alex Burrows won game SEVEN against Chicago in the 2011 playoff run. With that dragon slayed, the Canucks proved that they were a force to be reckoned with and not an easy team to beat. 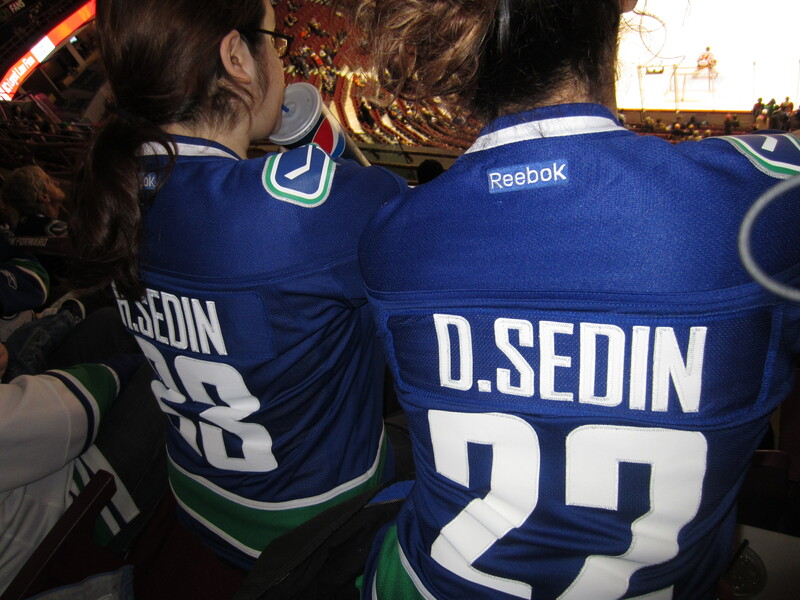 My favourite LIVE game that I went to was in March 2012, when Henrik Sedin was given a penalty shot and scored a goal. It was incredible to watch live and everyone was up on their feet cheering for Hank. My favourite part of the game is power plays where the Canucks sneak in and take over the game. My least favourite part of hockey is the shootout, I get so anxious for our boys that I have to leave the room when this happens. I also find a back-up channel on the TV to switch back and forth during shootouts because like all Canucks fans, I know the shootout has never been our team’s forte. For game day rituals, I always wear my Henrik Sedin jersey, get my beverage of choice in my Canucks collector’s cup, and get my day snack ready for game time. I never listen to the Canucks games on the radio because I believe that play worse when I listen to it and I never watch the games online due to my superstition that they lose when I’ve streamed the games before. I also have ice-cream, or dessert or a special beverage set aside for a reward when the team wins. My room has Sedin posters, my Canucks calendar, Canucks collector cups(yes fellow fans, I have several! ), Canucks hat, Canucks foam fingers (which I take with me to Rogers Arena when I go the games with my family). I go all out for supporting our team all season long and throughout the playoffs. As to the upcoming 2014-2015 season, I am really excited to see how our boys will do with a new coach and new teammates. I believe that this could be the year that the Canucks become Stanley Cup champions! With Ryan Miller to take Eddie Lack under his wing, the newbies on the team and our coach at the helm, I believe that this will be our best season since 2010-2011. We have regrouped and trained. I know that our coach will change up the lines and work closer with our players to shape them into a strong team. I would love to see Bieksa score more goals this season. I am really curious to see how the new teammates will fit in with our veteran players. Counting down the days until hockey returns, I am so stoked for the upcoming season! I forgot to mention that last year, I went to Raise-A-Reader for the first time ever. It was the best experience of my life as a hockey fan! 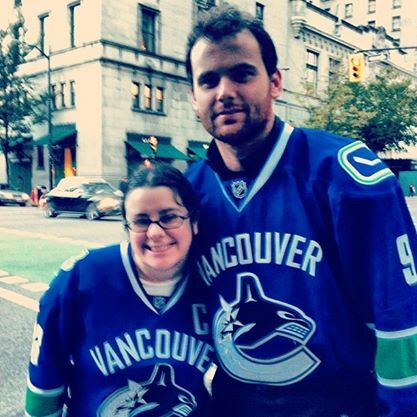 Meeting Zack Kassian and David Booth, and getting their signatures on my Canucks jersey was awesome! These guys were so nice in person and let me get my picture with both of them! That penalty shot that Hank scored on my birthday two years ago was a sight to see and hear, in a back and forth game! Makes you wonder how Hank can nail a penalty shot but in the shootout is questionable (albeit the Sedins haven’t participated often in the post-game one-on-one contest). I will say one more thing about shootouts, as intense as they are to watch(or avoid) on TV, they are MUCH more intense when seeing them live in the arena. I second your recommendation that all Canucks fans who are able to come, check out the Raise-A-Reader event in September, all of the money raised helps kids learn and be inspired, and as a bonus you never know which Canucks (present, alumni, or coaching staff representative) you might meet when you pick up your special edition morning paper! “Hello, my name is Jessica. This is my journey to true blue fanship. It was 1994 and I was in grade four. All the boys in my grade were obsessed with Pavel Bure and Trevor Linden. I was at a friend’s house after school and her family was watching a Canucks game. Her family had a rule that there was NO talking until the game was over, which at the time, I thought was a dumb rule. Later, I would learn that was the game they won the Western Conference for the 93/94 season. When Vancouver won over Toronto, everyone was screaming and crying with joy. 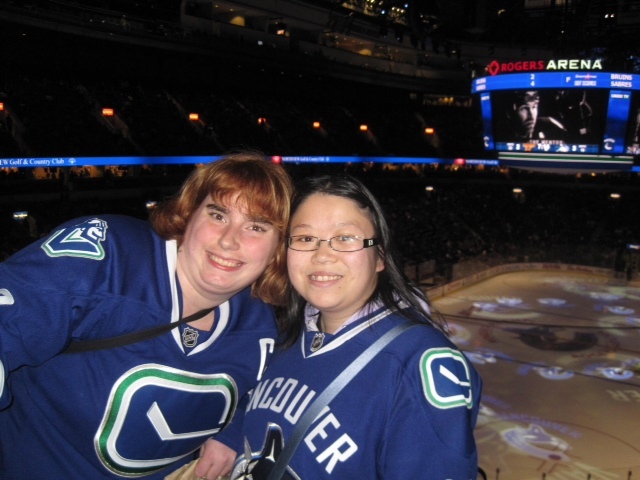 I couldn’t believe how much fun it was to watch a Canucks game and that Trevor Linden was pretty cute. In that moment, I knew I’d be a Canuck fan for life. My all-time favourite Canuck was Roberto Luongo. Say what you will about Lu, I do not care and I will stand by choice day after day. I have never seen a goalie take so much harassment, negativity and mistreatment with such dignity and grace. Enough said. Moving on to look at his goalie career, he had a way with the net as his whole body would block it and when he had the hot hand, it was HOT. Luongo used his whole body to goaltend and was never afraid of getting injured in order to save a goal. When he played on Team Canada, and got his gold medal in 2010 on home ice, I could not have been more proud. I watched the 2010 GOLD Medal Game on the big screen in downtown Vancouver and the energy was crazy. And then again 2014 as back up to Carey Price, I was even more proud. He has won 2 Olympic golds, World Cup gold, the Jennings award, and holds the all-time wins and shut-out records on the team, just a few of the MANY reasons that I love LU. My all-time hockey moment had to be April 11, 2007 against the Dallas Stars, aka the longest game in Canucks history. I was THERE, in the arena watching it all go down…all of the 5 hours and 21 minutes of total play, including 72 sensational saves by Luongo. It was game ONE of the 2007 Western Conference Quarterfinal and the 6th longest game in NHL history. I remember the stress, you could feel it throughout the arena. Everyone was tired, but nobody was leaving this game early. I was in section 301, right against the rail, first row of the upper level…we had an amazing view as there was no one in front of us. I remember the day clearly, I had been given ONE ticket only from my boss and my co-worker was given a ticket as well. Our boss rented a bus that shuttled us all to the arena, upon arriving there, I was in awe as I had never been to a playoff game and there were white towels on every seat. It did not take long until the towel power was unleashed. I have never seen so much excitement and positive energy and bonding of fans as I did when Hank scored that final goal. The crowd was explosive, people who were complete strangers were bombarding me with hugs, high fives and cheers. I will never forget it, what a rush. My pre-game ritual is to not watch/listen/read ANY news coverage on game predictions, as we all know they are as reliable as the weather report. Second I do not my jersey all day. I know…but I have tried and it is very difficult as #1: I work in healthcare and #2: when I do, it seems to be bad luck so I do not put it on until minutes before the game. 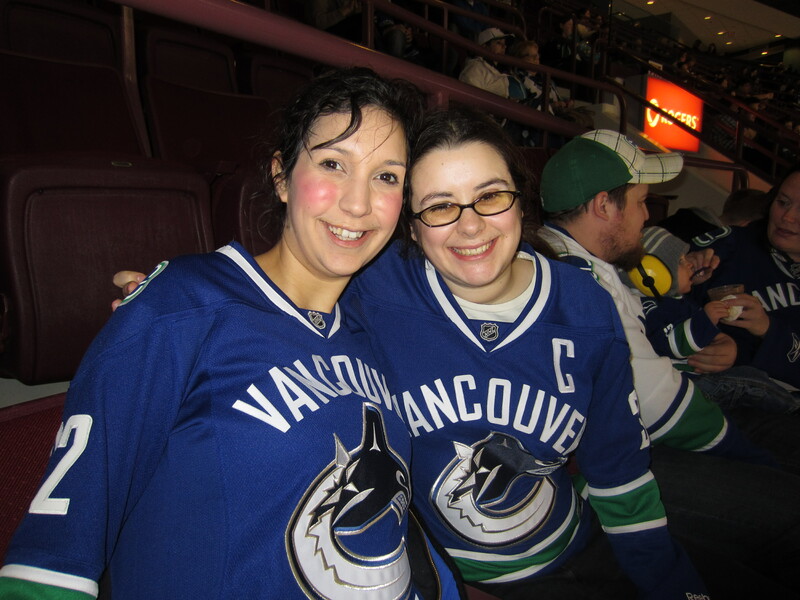 Also I like to wear a Canucks shirt under my jersey as well as a hat. If we are on a winning streak, I wear the same t-shirt jersey and hat and do not wash them until we lose. I think my favourite part of the game is being a fan and being accepted by everyone else in the group. Not just a bandwagon fan but someone who has grown up with hockey and breathes blue and green. Every time I get the chance to attend a game, I love meeting other fans and talking about our favourite players or going over game highlights from previous games. Although when we hate, we HATE and when we love, we LOVE which is our best and worst quality. The upcoming 2014-2015 season has given me a nervous feeling of excitement of the unknown. There have been so many changes, the good, the bad and the ugly. I’m going to compare it to falling into an abyss; you just don’t know if there is going to be something or someone to catch you. You don’t know. I know the changes had to be made and the team needed to restructure. I am curious to see how the changes influence our game. That 2007 playoff game was epic of all kinds and kept this early sleeper awake well past 1:00 AM because I didn’t want to miss any of the BIG saves from LU, or really any moment of that playoff madness. The moment Hank’s goal crossed the line made it all the more worth the sacrifice. Second, to me no matter where Luongo goes or what his jersey says, he will always be a Canuck at heart to me, and he will remain a favourite of mine until the day he eventually retires from this game. I’m with you on the not relying on any local media reports for pre-game predictions as well as the Canucks shirt+jersey+hat combo for games! Special thank-you to BOTH, Abi and Jessica for participating my True Blue series! I hope you all enjoyed learning two more True Blue stories and are looking forward to ones that are still to come as we inch closer to the puck drop of the regular season.